The PawSox never led in the nightcap, a makeup of an April 26 rainout. Robby Scott got the call for the spot start, allowing all three of the Chiefs' runs in his 3 2/3 innings. The left-hander did not issue a walk, continuing a very impressive streak of 11 appearances and 29 2/3 innings without a free pass. The aforementioned Moncada was not the only player making his first appearance following a promotion on Tuesday. Reliever Chandler Shepherd made his first Triple-A appearance after a strong campaign with Portland. Shepherd allowed two hits in 1 1/3 scoreless innings, walking and striking out one apiece. Noe Ramirez had his eighth consecutive scoreless outing, striking out two without allowing a baserunner in two innings. Dan Butler's two-run single in the fourth constituted all of the PawSox' scoring. Butler and Bryce Brentz each had two hits apiece. Brock Holt was 1 for 3 with a walk, but more importantly, he played all seven innings in the outfield in his second rehab appearance as he works his way back from a concussion. It was an exciting night at Hadlock Field, as top prospect Yoan Moncada arrived for his first game with the Sea Dogs with his name penciled into the leadoff spot. After grounding out to the first baseman in his first at-bat, Moncada singled to plate Tzu-Wei Lin in the third. He then came around to score on a Sean Coyle double. Reunited with Moncada after the two wreaked havoc on the Carolina League for two months, Andrew Benintendi responded by going 2 for 5 with a double, RBI, and two runs scored. Nate Freiman also had a big night, going 3 for 3 with a double, two runs, two RBI, and a walk. On the mound, Kevin McAvoy bounced back from a string of difficult outings to turn in a quality start for Portland. The righty came in with a 16.34 ERA over his previous four starts and more than twice as many walks as strikeouts. He turned things around Tuesday, allowing three runs on seven hits in seven innings, while striking out six and walking only one. He also induced nine ground ball outs. The Senators reached Williams Jerez for a single run in the eighth, and Jake Drehoff tossed a scoreless ninth. Salem had two players initially selected to participate in the High-A ball mid-summer classic, but with Moncada now in Double-A it was up to Mauricio Dubon (both pictured, left) to represent the Red Sox. Getting the start at shortstop and batting third, Dubon drove in the game's first run with a sacrifice fly, then had an RBI single and stolen base in the fifth. The Greenville Drive had a nominal off-day today, but you wouldn't know it if you glanced at the South Division's roster for Tuesday's All-Star Game. The Drive had eight representatives in Lexington, Ky., for the game, including five position players, and they accounted for both of the squad's extra-base hits. Josh Ockimey, after a breakout performance in the first half of the season, batted cleanup as the designated hitter, going 1 for 2 with a walk and HBP. Mitchell Gunsolus got the start at third base, going 2 for 4 with a double. Austin Rei, who has only a .301 slugging percentage, the lowest on the South Division roster, belted a solo home run. Luis Alejandro Basabe and Tate Matheny both went 0 for 2. On the mound, Jake Cosart fired a scoreless seventh inning, striking out the side with a walk and base hit mixed in. Anyelo Leclerc got the final out of the eighth inning, retiring the only batter he faced on a pop up. The only Greenville player named to the team who did not see action was 18-year-old hurler Roniel Raudes. The Spinners continue their hot start to 2016, advancing to 5-0. Victor Acosta has been a standout at the plate, going 2 for 4 with a triple and three RBI. He has hit safely in all four games he has played. Matt McLean was on base four times, as the 2016 ninth-round pick went 2 for 3 with two walks and a run scored. The most exciting development of the evening was the performance of 19-year-old left-hander Darwinzon Hernandez. Making his stateside debut after two seasons in the Dominican Summer League, Hernandez allowed one unearned run on one hit in five innings. He struck out four and didn't issue a walk. While Hernandez previously had his fastball clocked in the 88 to 90 m.p.h. range, SoxProspects.com Director of Scouting Ian Cundall had him at 91 to 93 and touching 94. The Crosscutters reached Pat Goetze for three runs in two innings, but Gerson Bautista slammed the door on the attempted rally, striking out three in two scoreless innings. The Red Sox1 squad couldn't get started due to the weather. A make-up date has not been announced. A trio of Sox hurlers stymied the Mets, with starter Jose Gonzalez doing the bulk of the work. Gonzalez allowed just one run on three hits in five innings. He struck out three and walked two. Andres Jimenez and Warlyn Guzman combined for four shutout frames. Albert Guaimaro continues to heat up, as the center fielder went 2 for 3 with a walk and run scored. It was the third multi-hit game in his last five outings, which has helped him raise his average 60 points. 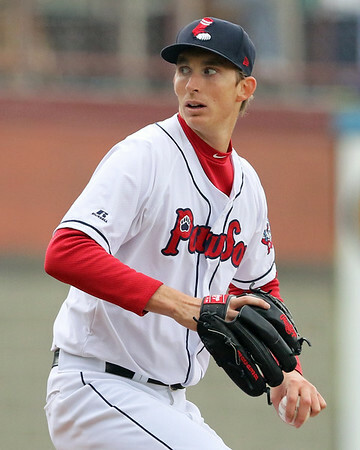 Player of the Day: While most eyes were fixed on Moncada Tuesday, it was Henry Owens who turned in the outing that might be most meaningful in the near future. With a spot in the rotation that now lines up with that of Clay Buchholz, the left-hander may get another chance in the majors if his excellence continues.